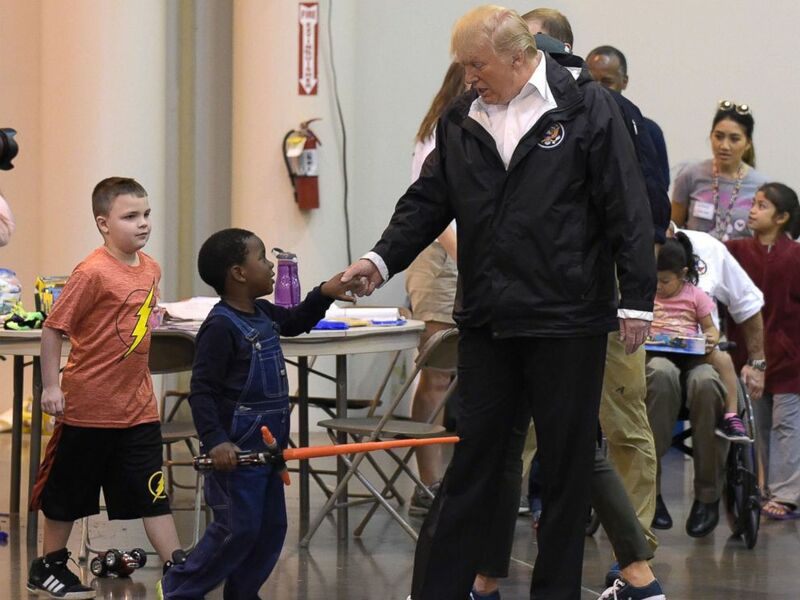 As the Texas Gulf Coast reels from the damage and flooding from Hurricane Harvey, President Donald Trump returned to the state on Saturday to meet with families whose lives have been upended and volunteers assisting with the rescue and recovery efforts. After arriving in Houston early on Saturday afternoon, Trump and First Lady Melania Trump visited with those displaced by the storm at the city’s NRG Stadium, which is serving as a relief center. Texas Governor Greg Abbott and Houston Mayor Sylvester Turner were at the airport to greet Air Force One today, and are joining the president as he visits with evacuees and volunteers. During the stadium visit, the president at one point chatted with members of the press, and spoke optimistically about the recovery effort and what he's seen, saying "things are working out well," and that the recovery effort has been a "beautiful thing" for the country. "They were just happy, we saw a lot of happiness," the president said of his interactions with storm victims. "It's been really nice, it's been a wonderful thing... as tough as this was, it's been a wonderful thing I think even for the country to watch and the world to watch, it's been beautiful." 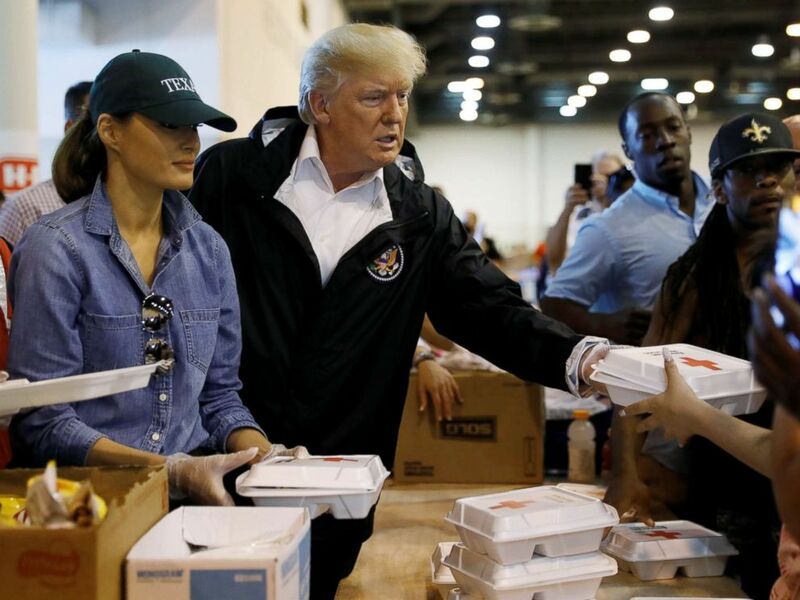 President Donald Trump and first lady Melania Trump help volunteers hand out meals during a visit with flood survivors of Hurricane Harvey at a relief center in Houston, Sept. 2, 2017. President Donald Trump meets people impacted by Hurricane Harvey during a visit to the NRG Center in Houston, Sept. 2, 2017. As Trump walked around the center, he stopped to chat with victims and volunteers, posing for selfies and flashing his signature thumbs up for the cameras. The first area that the president visited seemed to be a play area for children. 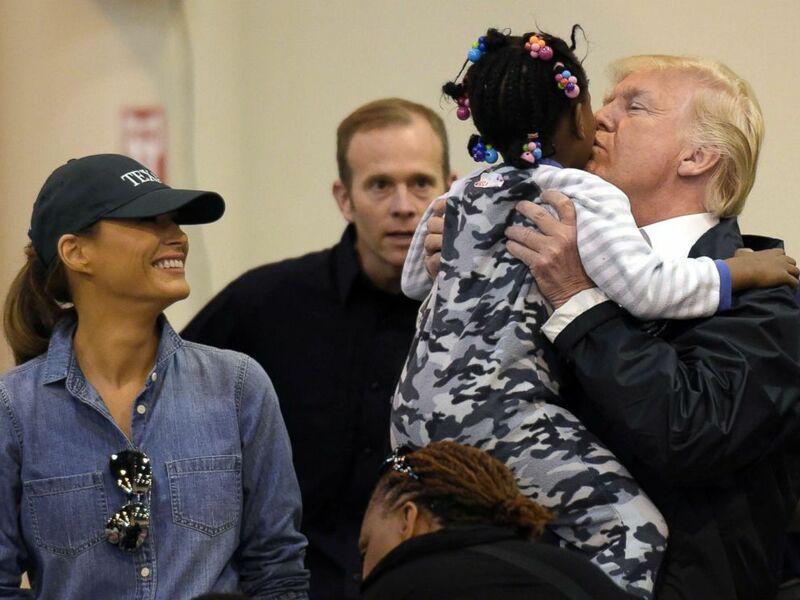 At one point, a young child ran up to the president and gave him a hug. A few other kids joined in, and the president lifted one up in his arms for a moment. Trump also spoke today of the letter the White House sent to Congress Friday night formally requesting $7.85 billion for Harvey response efforts, saying he was hopeful that the funds will be approved quickly. House Majority Leader Kevin McCarthy's office says the House will vote on Harvey funding next week. Throughout the visit, the first lady could also be seen hugging, smiling, and speaking with victims. President Donald Trump and Melania Trump meet people impacted by Hurricane Harvey during a visit to the NRG Center in Houston, Sept. 2, 2017. On his second stop in Texas today, Trump visited a church in Houston that's serving as a distribution center, and offered his congratulations to Abbott on the recovery effort so far and predicted that Texas will defy expectations with the pace of its recovery. “I want to congratulate the governor. I want to congratulate everybody who has worked so hard. It's been an incredible five days, six days. Seems like it was much longer, but it's going so well that it's going fast,” he said. After his remarks, Trump joined an assembly line of volunteers outside the church and helped place boxes of supplies, cases of water, and Red Cross buckets into the back of a row of cars. Education Secretary Betsy DeVos, Housing and Urban Development Secretary Ben Carson, Veterans Affairs Secretary David Shulkin and acting Homeland Security Elaine Duke are along for the trip, as are Chief of Staff John Kelly and Homeland Security Adviser Tom Bossert. This is Trump's second trip to Texas since Harvey rammed into the southeast part of the state on August 25. On Tuesday, he visited Corpus Christi and Austin, but opted to spend time with state and local officials rather than meeting hurricane survivors or touring the damage firsthand. Harvey is the first natural disaster Trump has had to respond to during his presidency. He has also pledged to give $1 million from his personal funds to help disaster relief in Texas and Louisiana, according to the White House. 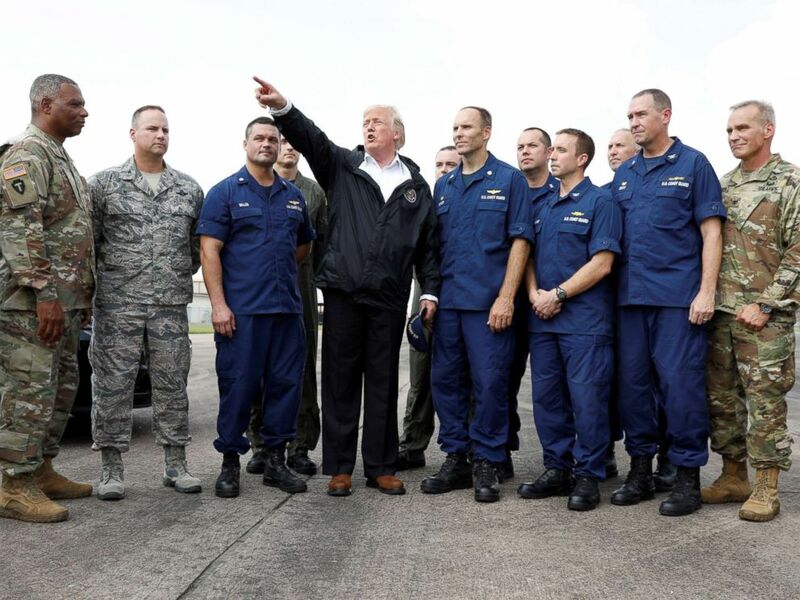 President Donald Trump speaks with troops and members of the United States Coast Guard at Ellington Field, in Houston, Sept. 2, 2017. Before departing from Ellington Field later on Saturday afternoon, Trump said thank you to service members and offered more congratulations. While on the tarmac he was greeted by a group of Texas lawmakers, including Rep. Michael McCaul, Rep. Pete Olson, Rep. Randy Weber, and Rep. Al Green and Rep. Sheila Jackson Lee -- two outspoken critics of his administration in Congress. After spending time greeting service members lined up to take photos with their cell phones and shake hands, the president greeted Coast Guard members. After Houston, Trump headed to Lake Charles, Louisiana for a visit to the National Guard Armory. Upon landing in Louisiana, he and the first lady were met on the tarmac by Louisiana Gov. John Bel Edwards, Sen. Bill Cassidy and Sen. John Kennedy, and a group of Louisiana congressmen. Inside the armory, the Trumps met with troops, volunteers with the Cajun Navy and civilians, before departing for the return flight to Joint Base Andrews. ABC News' Veronica Stracqualursi and Jordan Phelps contributed to this report.